S.A. Gear has been manufacturing timing components since 1986. The factory and warehouse is 70,000 sq ft. on 4 acres in the prime manufacturing district of Chicago. 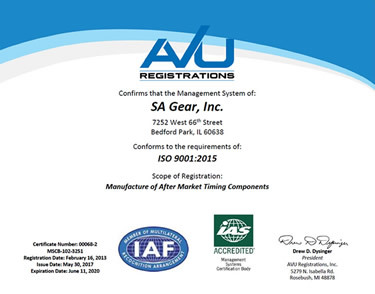 S.A. Gear is ISO 9001 certified and manufactures timing sprockets, gears, and chains for the automotive aftermarket. We have a full line of timing components to cover domestic, foreign, and performance applications.